For legal reasons, I cannot say that I sanded myself with the 3M brand of micro abrasives. I will ask a reader to infer usage of the product under discussion. I will promise that if sometime you should see me, and you can prove that you are not a federal marshal, I will demonstrate what I have done to myself, my abradement endeavor, in a private shelter. This project assumes a reader capable of imagining me, a headstrong girl in her forties, of using tools and materials to shape her oblong flesh craft, her vessel of demise, her body, into something statistically amazing. Micro abrasives are far smoother than average sandpaper. 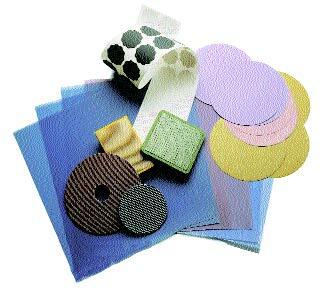 They reveal something incredible about abrasives in general: Everything is sandable, and everything is an abrasive. Unless two objects share a smoothness factor, a grit level (measurable in three scales: Knoop, Mohs, and Rockwell C), then one will abrade another. A person who has soaked one hand in sheep’s milk his whole life, while cleaning toilets and spanking his father with the other hand, will have two hands of quite different grit level. If the spanking hand were to be set to rub against the sheep’s milk hand (oh goody, oh goody), it would, over time, rub that hand away. Thus the Irish maxim: It takes a coarser hand. It is not new to discuss the body as an abrasive, capable of erasing other bodies or things.To find early mention of this, I refer you to the personage Jesus Christ, who revealed, with a piece of forty-grit callus that had grown upon his foot, that he could sand the earth as he walked, creating transparencies (footsteps), that qualified as a desert choreography for his followers. Nor am I the first to observe the irony that the earliest act of sanding occurred upon… sand itself. But more on abrasives. Diamond is the hardest material at the present historical moment, with a Knoop rating of 7000, maxing out at 10 Mohs.At only 1 Mohs, talc does not even earn a Knoop rating. Gypsum is the first material coarser than talc to deserve that, and it only comes in at 32 Knoop. A good Japanese chisel earns a Rockwell C rating of 64 (Knoop 822). Silicon carbide, at 2480 Knoop, is the material used to make most water stones, which in turn are used to sharpen those Japanese chisels (at triple the Knoop, they can do this quickly). But water stones require an increasingly terrifying liquid— water—for lubrication, and they are messy and easily fall out of true. Enter the ScarySharp™ sharpening system, which proposes that ultra high grits of sandpaper be used instead of water stones.The 3M micro abrasive line, typically used to polish the paint jobs on cars, is perfectly suited for this. These sheets of .5-micron chromium oxide, mounted on 3-mil Mylar, are smoother than you are, even if you have ultra smooth parts that have yet to be coarsened by strangers. They will put a mirror finish on just about any steel edge. But I have no steel edge. I need no sharp tools. What I need, terribly, is a smoother, smoothening suit of clothing, much like a bunting that will apply abradement to the atmospheres I hone. Yes, all textiles, as we know them, are abrasives. But they are more commonly abraded upon, either by rubbing themselves into nothing, or the caterwaul of the washing machine, or the chiseling effects of the Midwestern wind. Here, then, is what I have done. Using the 3M micro abrasive sheets, I have fashioned a suit of clothing to be worn only at night. Soon my plans will be downloadable. I am no seamstress, so I imagine my efforts will soon be surpassed by experts of the needle. But, with my micro abrasive suit, I am cutting, literally, a wider and wider path. And should you feel cut upon, rubbed against, chafed away, that just might be me, wrapped in sandpaper, walking past you.